Have a favorite pint brand and flavor? A favorite scoop shop? Post to the Pint Pal blog to share your thoughts with a community of ice cream enthusiasts like you. Half Baked Ice Cream and Chunky Monkey (Ben & Jerry's)–A regular weekend occurrence about to get better because of Pint Pal. Coffee and Mint Chip (Haagen-Dazs)– I really look forward to giving these as a gift AND using one for myself! 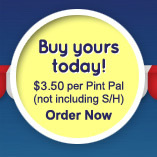 Cookie Dough and Phish Food (Ben & Jerry's)–I wanted to order Pint Pal as a stocking stuffer surprise. Halo Top–She really loves it to satisfy her sweet tooth. Chunky Monkey (Ben & Jerry's)–My boys needed their own as a Christmas gift. NY Super Fudge Chunk (Ben & Jerry's)–A great X-mas gift for my adult daughter. Bananas Foster (Haagen-Dazs)–It's limited edition so you may have to do a little searching but sooooo worth it! Red Velvet Cake (Ben & Jerry's)–Cake and ice cream--almost as good as ice cream and Pint Pal! Chocolate Peanut Butter (Haagen-Dazs)–My fiance and I love it; we hope the same for Pint Pal. Any Dove pint–Love the layer of chocolate ganache on top; frozen treats help beat the heat, Pint Pal keeps it neat! The Buckeye State (Jeni's Splendid Ice Creams)–Peanut butter & dark chocolate--simply amazing! Pfish Food (Ben & Jerry's)–It's heavenly with a Pint Pal! Raspberry Sorbet (Haagen-Dazs)–Pint Pal prevents the frozen headache--they're both so great. Ben & Jerry's Scoop Shop–can always find my Mint Chocolate Chip there! The Chocolate Bar (Houston, TX)–they've been on TV for their chocolate creations and cakes, but their ice cream flavors are AMAZING (root beer float, chocolate covered strawberry and on and on); and they'll hand pack a pint to go! Graeter's–a wonderful variety of flavors, especially the ones with chocolate chunks in them! Friendly's–they've been around forever but you can't beat their sundaes. eCreamery (Omaha, NE)–love their custom made pint flavors. Jaxson's Ice Cream Parlor (Dania Beach, FL)–some of the greatest offerings you'll find! Shake Shack (New York, NY)–while most go for the burgers, the frozen custard is great and then blended with awesome toppings to create amazing ice cream concoctions!